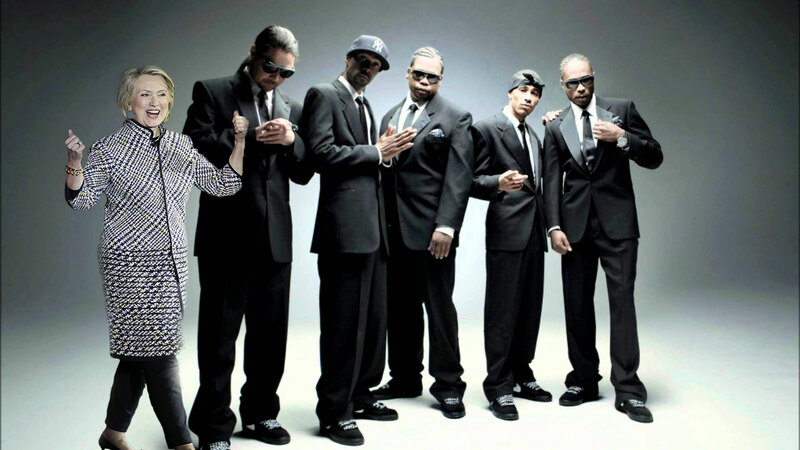 Not sure if Hillary can sing or not…I’ve never heard her in the shower, but it seems as though she’s a big fan of good music by African Americans. She has been seen doing trendy dances and going to historically black churches, so it is only right that she embraces one of the best R&B groups, Bone Thugs n Harmony. Just imagine the photo shoot, a promo for her campaign, and behind the scenes one of the groups famous songs “Crossroads” is playing in the background while she jams out and jokes about how “They don’t make music like this no more”. Somehow it has always been a trend, to get the black vote……you need to surround yourself and pose as if you are a part of “black” culture. Honestly I can even see her featuring on one of their songs because nothing is to far fetched in this election. In this project we were suppose to take a pop star and put them out of place in another image. I followed the youtube video provided step by step using Photoshop, I chose a picture that has similar backgrounds and I flipped Hillary’s image to the opposite side because it fit in the picture better. It was a pretty cool project. Hey the image size was so small I didn’t even see what you’d done there at first! You should use the pencil icon after clicking on the image in the post while editing. Then you can resize to full size or large. It’s really great! And this one date’s me, but you should check out Bill Clinton playing the sax during his first presidential bid in 1992. I believe it was on The Arsenio Hall Show.